A (somewhat) standardized way to measure high voltages is to see how big an arc can be established between two one-inch conductive spheres. The roundness of the spheres normalizes against surface effects that are present in pointier objects. I grabbed some 1-inch chrome steel bearing balls. Perfect. Now, how to connect them? It turns out, it is possible to solder copper and stainless steel. Here’s how. I had some beefy 4 ga. copper ring terminals around from another project. And I had just picked up a Bernzomatic plumbing torch that comes with silver-bearing solder and flux. Don’t use the sliver-bearing solder. Nobody’s going to eat off this, so go ahead and use regular leaded solder, which is much easier to work with. Coat at least half the bearing ball with blue-tack. This will help keep it in place, as well as preserve the metal finish. Using a regular soldering iron, melt a good amount of solder on to the copper terminal. 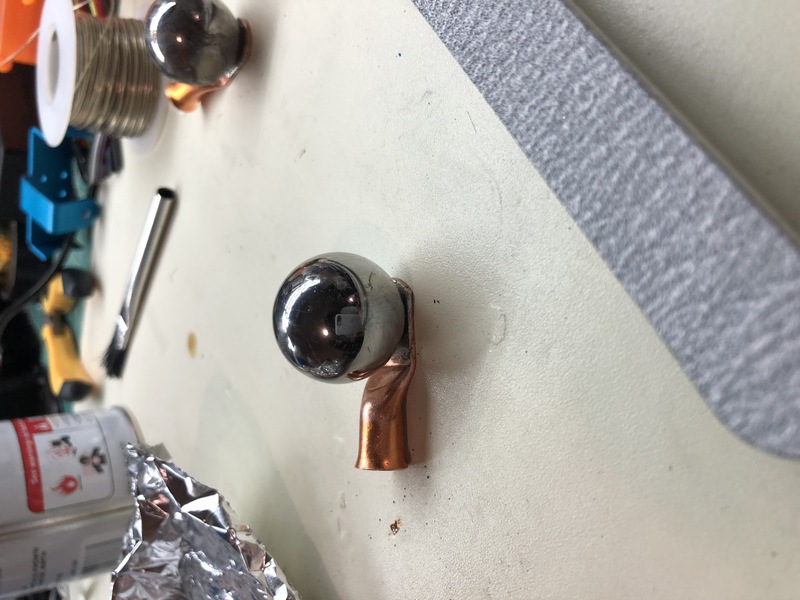 Arrange for it to be upside down, so the bulk of the solder collects on the part that will be in contact with the ball. Using gritty sandpaper, sand a rough patch on the steel ball. This will remove the invisible outer layer of oxidation. Immediately apply a dollop of plumbing flux on the sanded steel. For good measure, I used a few drops of really strong acid flux, but this might not be necessary. Holding the copper terminal in a long-nose pliers and pressing it against the fluxed steel, fire up the torch and gently go over the contact area until the solder melts and adheres. Let it air cool for some time, then run it under water to wash away any remaining flux or acid. Voila. Make a second one of these, then stand them up near a plastic ruler, and let the arcs fly. This entry was posted on Monday, June 11th, 2018 at 12:03 am and is filed under electronics.